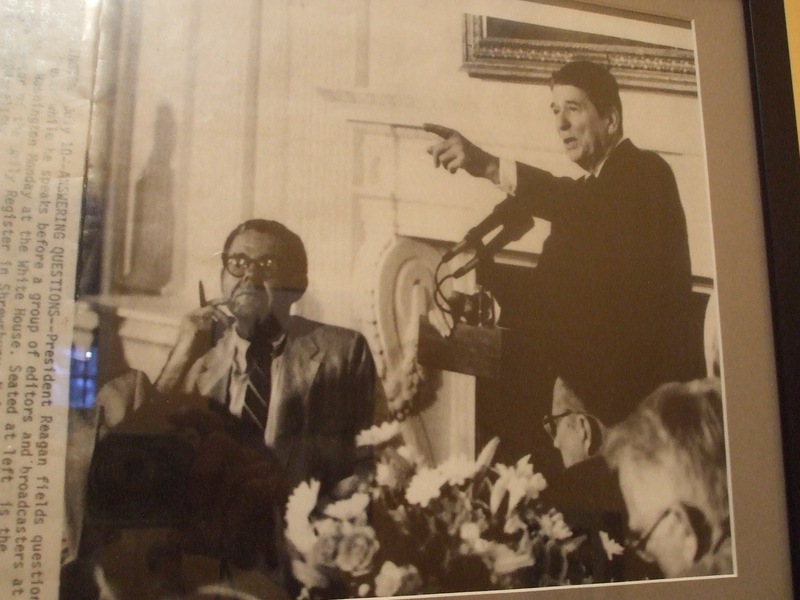 a beloved, bespectacled man died this week. my husband’s father. the original mensch. a man i most remember with his face crinkled by the folds of a smile that enveloped from chin to forehead, and, best of all, with a single tear trickling down his cheek from behind his tortoise-rimmed glasses. i see him at the dining room table, holding up a short glass of wine, as we sit down to bless shabbat — the sabbath — and i hear him reciting the Shehecheyanu, the jewish blessing for those rare anointed moments in time, when, as the prayer says, we thank God for enabling us to reach this sacred occasion. my father-in-law — a man so tender to me you might never have guessed how hard it was for him, early on, that his only son was in love with and marrying a catholic, even an irish catholic — died on the eve of Yom Kippur, the holiest of holy days, the day of atonement, of fasting, the day of judgement. a day when jews (and those who love jews) wrap themselves in their deepest prayers, and the prayers are laced with unflinching references to death, to dying, to lives well lived — or not. who shall live and who shall die? who shall perish by water and who by fire? who by sword and who by wild beast? on and on the prayer pulses through the litany of life’s endings, not a one of them softened for easier going down. the prayers, some of them this year, made the raw ache of this brand-new death even harder. they stung, some of the words, so i squeezed my husband’s hand as tightly as i could, and i kept watch. i watched his face, in profile, through the hours of prayer; kept watch for tears in his eyes, for that faraway look, for the moments when he swallowed hard. i kept watch on the visage of grief, and imagined the landscape inside. but there came a moment in the day of atonement prayers, toward the end of the day, when the sun was setting, and the shafts of light streamed in from the west, turning the sanctuary from blinding gold to rosy. it’s a part of the day of prayer called the memorial service, and tradition has it that children are kept outside — too sorrowful. the words and the prayers are tinged with mourning, with longing for lives lost. but amid the sadness, there is a prayer i have always loved, a prayer that wraps its words around me like the softest afghan, a prayer that makes me feel the brushstroke of God, quite honestly. it is pure embrace of a prayer. and it has never held me more tightly, nor more tenderly. 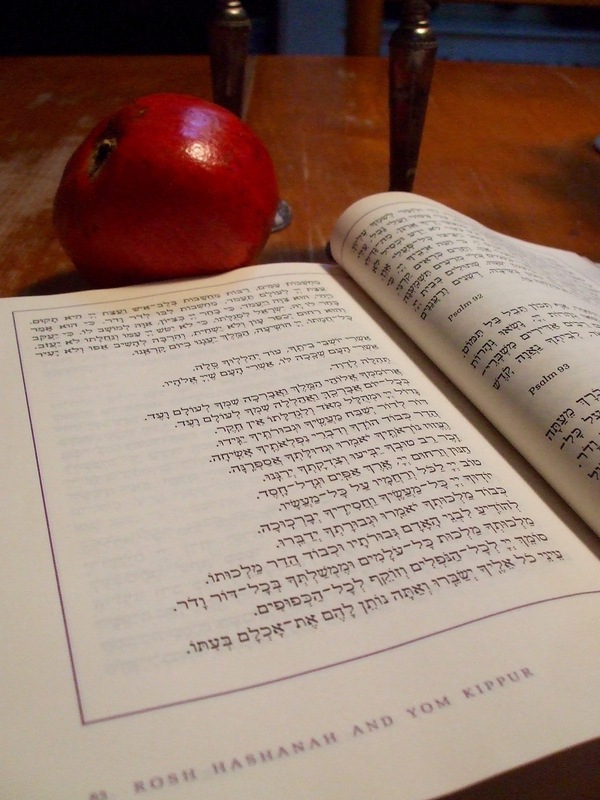 what i love most is that, like so many jewish prayers, it pulses with a deep interiority. it rustles through the soul. it captures the quiet of the human heart. it breathes into the crevices of our consciousness. it understands perfectly how it is to be alone with your grief, with your longing, and to feel your heart swell and spill, as that rising up of love and loss, intermingled, so defines grief. and it grasps for breathtaking pauses in the beauty of the passing year, in the turning of the seasons, and it anoints those moments, those unfoldings, as vessels for remembering, for loving, for stepping bravely into a world without the ones who have defined us from the beginning of our time, or for as long as we have loved them. the truth of today is that i am holding tight to prayer for one other someone i love tenderly and dearly. 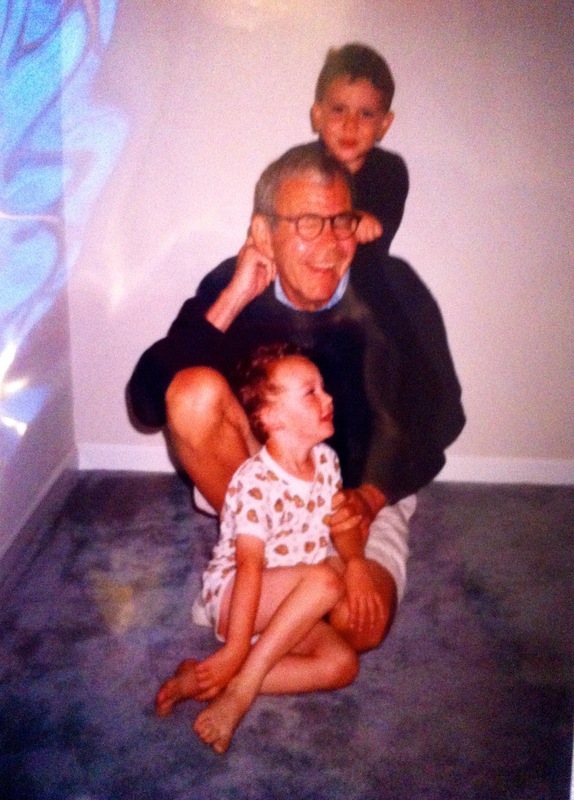 someone with whom i have shared deeply sacred moments, and hours of animated conversation over the decades. hours curled up on a couch, afghan covering our feet. hours in the kitchen. hours at the dinner table. hours walking in the woods. hours cradling our newborns. hours adoring our growing and nearly-grown children. hours marveling at her energy, her spark, her heart that knows no bounds. she is still here, but already i am remembering. and loving till the end of time. and this just in, my beloved father-in-law, the son of an immigrant baker who rose to become editor and president of a new jersey newspaper, the one that covered the news of the jersey shore, read the forward, the legendary jewish newspaper every day for years and years (it was originally written in yiddish). so my husband, who wrote a beautiful obituary for his father, rewrote one with a yiddish twist for the forward. and it runs there, as of minutes ago. 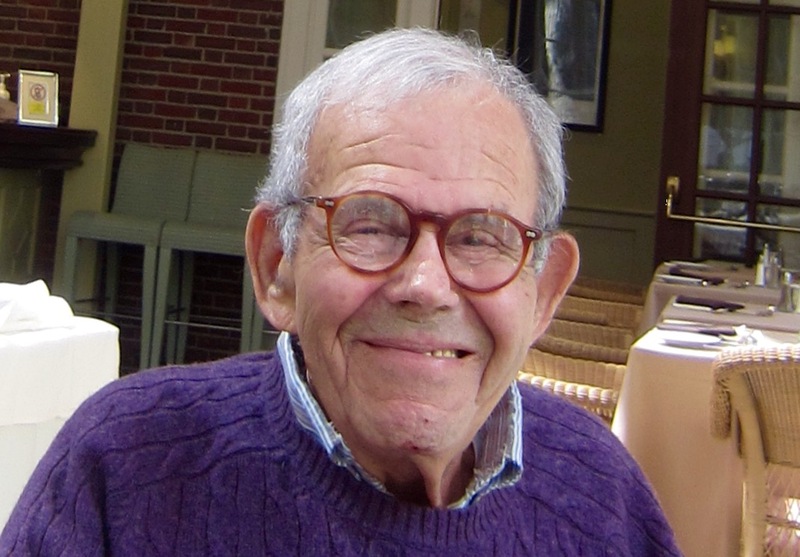 the headline: Arthur Z. Kamin, Trailblazing New Jersey Journalist, Dies at 84. for my tenderhearted newsman of a father-in-law, this is the much deserved trumpet blast at the close of his most beautiful life. this day, i send deepest love first to my beautiful beautiful mother in law, and to my blessed sister in law who i will soon be with. their loss is vast and without borders. hold them, and my sweet blair, and will, and especially little teddy whose tears will not be stanched, in your whispered prayerful hearts. and here’s the question of the week: what words bring you comfort when you are aching in sorrow? she asked for a poem, my beautiful friend did. she asked for words. she asked for my voice. she asked so that “at certain times,” in the dark dark hours that come when you are lying in your bed, or curled on your couch, when the knife-to-the-gut of cancer won’t stop, when you tremble deep down inside, when all you want is to wail but you can’t, she asked “to be soothed” by the sound of the human voice rising and falling and wrapping around letters and lines and syllables and silence and words, each word a vessel of hope, a finger to grasp, the next best thing to morphine. or, maybe, better. it was a blanket of sound she was stitching together, my friend whose world has always been about sound. she’s gathered sound all around the globe, on nearly every continent. she’s woven sound into story, story that shattered hearts, peeled back truths, shone beacons of light. sound that reached out through the squat little box that sits on the kitchen counter, or the flat rectangular one that blinks red numbers just beside my bed. sound that could draw me to the ends of the earth, or into the depth of someone’s long lonely walk through a mountain pass, or down a dusty country road. it might be the sound of a katydid. or a jackhammer. or maybe the cry of a mother who’s just buried her child. it might be the whistle of wind she records. or the story in spanish of someone who’s been lost for too long. her life has been a tapestry of sound, one that my friend has pieced together with fierce intelligence, unparalleled heart, and a light in her eyes that will never go out. so, in her darkest hours, in the hours when the walls seem to be squeezing in from all sides, she asked for more sound. for the sound of the human voice, doing what it most sacredly does: putting breath to the balm that is love, that is tender and dripping with mercy, that heals, always heals, and that just might be the last earthly tie, one heart to another. it’s no mystery why mamas sing lullabies to their babies. why mamas turn pages of storybooks. why mamas make “mmm” sounds and sigh to their wee little newborns. the human voice is breath + vibration + heart, is sound put to flight. the instrument of that flight might be a screech, or a whisper. it might be vicious and crack in half the heart of the one who hears it. or, in the case of my friend, it might be the best shot for soothing, for wrapping a blanket, a compress, of undying love. and, yes, it might be a poem. the healing power of the hard-chosen word, words plucked from the star-stitched heavens, beauty and heartbreak distilled. that’s poetry. and, no, it won’t cure cancer, certainly not. but there are ails along the way that poetry — a poem read aloud by someone you love — will always be able to heal. it will break through the canyon of fear and of emptiness. it will cradle the tired. and, as best as is possible, it just might dull the ragged edge of the pain, and, maybe just maybe, soften the suffering for as long as it takes for the poem to be read and maybe to linger. i knew right away the poem and the poet to which i would put my breath and my heart: mary oliver. “praying.” it’s the poem i tucked on the very front page of my very first book. it’s a poem about paying attention, about patching together a few simple words, nothing elaborate. it’s about prayer not being a contest, but a doorway into thanks, and “a silence in which another voice may speak.” it’s about stitching together prayer, and it’s something my friend and i have talked about — many times, once while wandering about a wooded magic hedge. i knew, too, right away, just where i wanted to read it, the poem about prayer — amid my late-summer garden, so the words of mary oliver would be enfolded, would be punctuated, with the sounds of this summer drawing to a close: the few cicada still buzz-sawing, the blue jay who squawks, even the wind rustling through the boughs of the willow. i whispered a prayer, took a breath, and pushed the little red “record” button. my friend asked for a poem. i sent her the pulse of my heart, and a sound-swatch of the late summer garden. i wanted to quietly lay this on the table because i know that among the chairs circled here, there are hearts intent on finding ways to bring healing to the world, and i thought it the most beautiful quiet creation, the notion of my friend to weave together a patchwork of poems, all in the voices of friends, all for the purpose of soothing. it’s a simple gift, a pattern we can all trace and retrace, should the need arise. it might even be a baby gift, a gift at the launch of life, when you wrap not just a favorite picture book, but the sound of your very own voice reading it, turning the pages. the gift of your voice is one no one else could ever give. and it comes from the depth of your heart. priceless. 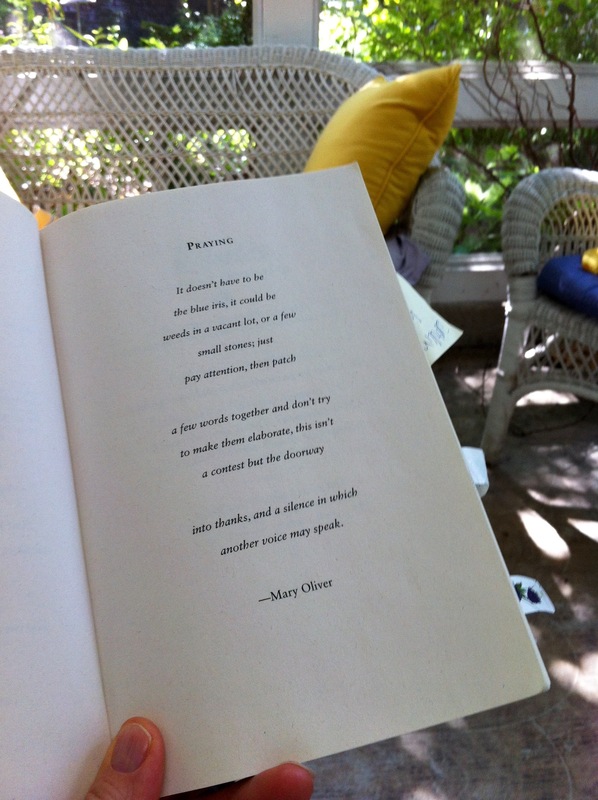 because i happen to know that mary oliver doesn’t want anyone printing her poems anywhere without permission (i asked for and received full permission for the epigraph of slowing time), i am honoring mary’s heart and will not print it here, although it is in the photo above. and you can read it yourself if you open the book to just past the dedication page. and, miracle of miracles, i figured out how to drop a line of poetry reading onto this latest meander. wonders never cease. so here’s the question: if someone you love asked you to read a passage or a poem, what one would you choose? i don’t often bring world news to the table. not because i don’t pay attention to it each and every day. mostly because most of the time the holiest way i know how to live is to saturate the moment, the space before me, with all the heart and soul i can muster. but there are moments and images that shatter. that land on my kitchen table with the plop of the morning’s newsprint. that stop me cold in my tracks. that propel me to drop to my knees, or tumble me out the door, where i stand beneath heaven’s dome, and i open my heart and my prayers, and i beg for an answer: what can i do? what can we do? how can we gather up this suffering, how can we put balm to the wounds of the world, how can we heal the broken children, broken dreams, broken hearts? dear God, how can we make a drop of a difference? 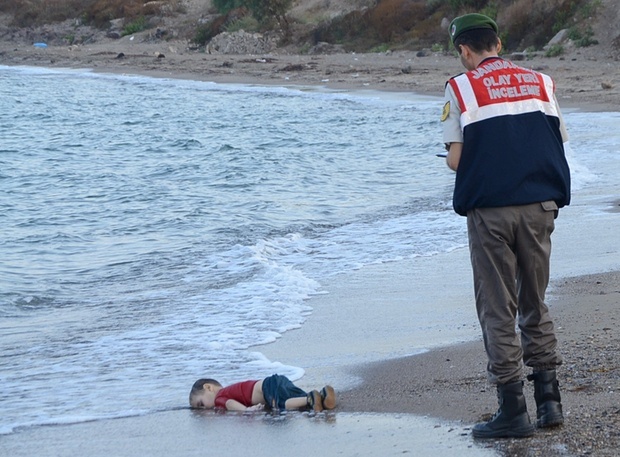 so it was when i saw the photo of the turkish policeman lifting the little syrian boy who had drowned in a moonlit sea. drowned when a boat built for 10 had been loaded — overloaded — with 17, too many of them little children. not long after setting out across the aegean sea, escaping from the war-torn hell that is syria, hoping to make it to kos, the island off greece, the little boat capsized, and 12 children, aged nine months to 11 years old, were lost, drowned in the dark, dark waters. i’d seen the photo the day before of the limp little boy, face pressed against the sand, bare little legs, sensible shoes buckled, still buckled, after he’d washed to shore. 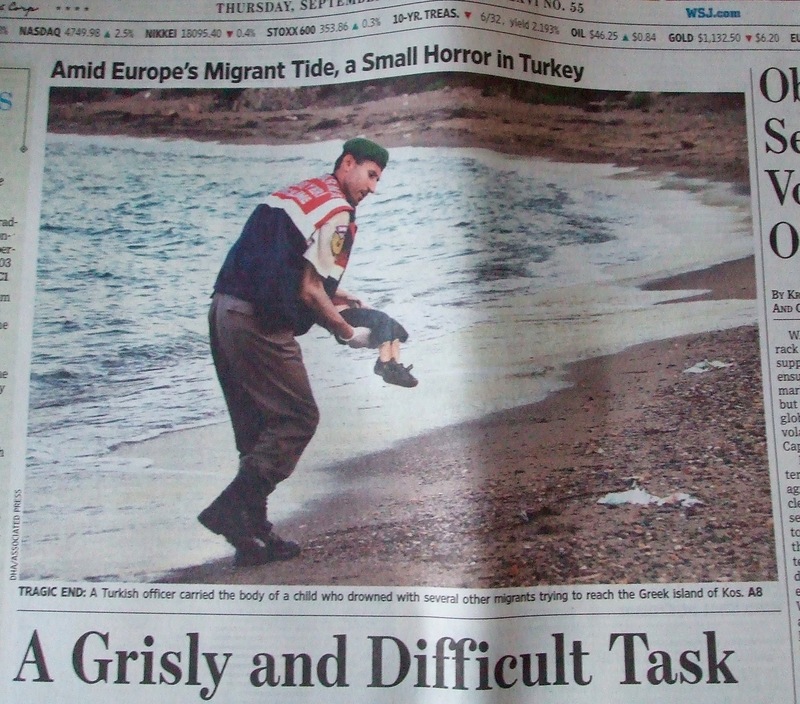 and then the next morning’s news — on the front page of the wall street journal, a paper held in the hands of decision makers around the U.S., around much of the world — showed the next frame in the story: the turkish policeman lifting, cradling, the little boy. the legs limp, bent at the knee, a little hand folded across the little boy’s tummy. dead and alone at the edge of the sea, chased away by a war that won’t stop. little boy, being lifted too late. and so we need to pay attention, all of us. amid the first light of dawn, i offered a prayer for the little boy, and all of the others. truth is, i don’t know what to do, and my prayers feel too hollow. not that they’re not prayed with fiercest urgency. but what i want is to airlift myself to the syrian shore, where throngs of terrified mothers and the children who cling to them are emptying their pockets and purses of whatever currency they can manage to scrounge, climbing into rickety boats, and setting sail under the light of the moon that glistens across the water, and falls, too, across my backyard, falls across my collapsed black-eyed susans and the anemone that nod through the night. (is there not some mystical unifying force — lunar pull — as the beams of the same gibbous moon shine down on all of us, syrian refugees adrift on the sea, and, halfway across the very same globe, our own ramshackle gardens?) i want to walk through the train station of budapest, where babies are cradled against mamas’ chests, tucked under arms, made to sleep on the hard station floor, or out in the city square, where one family — a syrian refugee father, his wife, and their baby — threw themselves across the train tracks in protest, and would not be moved. i want to reach out a hand, offer my home as a place to sleep and eat and be safe, find their bearings in this terrible world that’s chased them from their home, their life, the world as they knew it and loved it. i’m certain i sound naive, my too-simple solution, my impulse for healing the wounds of the world. but how can we believe in the power of love, the gospel of love, and not believe in trying? so what will we do, those of us captured by the image of the drowned little boy, haunted all day by the shrieks followed by silence? there is a river of humanity — women and children and the men who love them — pushed from their homes; rickety boats succumb to roiling seas, and trains refuse to budge, won’t carry the war-torn to safety. the world is watching. we have promised and promised again: we won’t stand back and watch horrors unfold. horrors are unfolding. voices are crying. never again, we promised. so how are we keeping our promise? the question is literal as much as rhetorical, what can we do? what wise response might we muster?